To quote Jean-Luc Godard, a story should have a beginning, middle and end but not necessarily in that order. Previous readers will have noticed a distinct theme – enthusiastic amateur cyclist takes on a decent but definitely attainable challenge, fails to prepare bike or body, has an unfortunate toilet related incident, suffers a setback that surely heralds failure but somehow muddles through to the end. But not this time baby, oh no. And not only because I didn’t have cause to utter waar is het toilet alstublieft? once. I really wasn’t having much fun. And I only had myself to blame. The wind was bitter, my shoulders slumped and I’d last seen my cycling companions a couple of hours previously. I also had no idea where I was or how far I had to go. But what I did know was that I had Oude Kwaremont and the Paterberg still to come plus “a 10 mile slow tap” back to the campsite afterwards. Suddenly the gung ho bragging the night before about not carrying food and drink didn’t seem so clever. Clearly I’d cooked my own spleen, farted into a fan if you will. 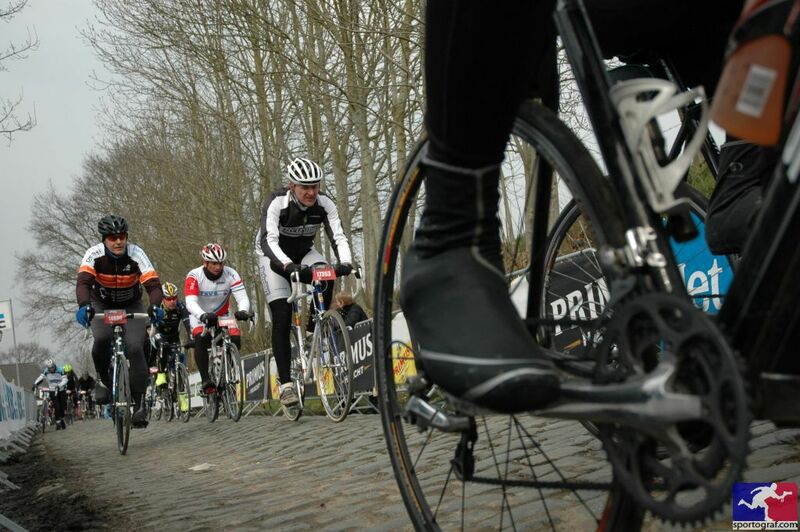 I’d ridden the Ronde van Vlaanderen with Ruddock and The Mechanic in 2012 and, quite bizarrely, wanted to return. This time I was with a different group, keen and lean cyclists all who were thinking nothing of riding 10 miles to the start (easy enough) and then 10 miles home again at the end (dear god). Weighing myself before leaving home, I was just shy of 16 stone and with the defined musculature of Spam. Julian, who I was travelling with, was 11 stone and had written strategies for food, clothing and hydration. But I’m getting well ahead of myself so, embracing the spirit of La Nouvelle Vague, I’ll go back to the start. Right, let’s get something straight from the off. I like cycling, enjoy company and love red wine. Put all three together in Tuscany sounded perfect with nothing that could possibly deflect from sheer, unrelenting enjoyment. No matter what follows, I just want to be clear about that before I get started, that’s all. 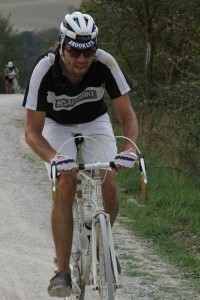 L’Eroica (“the heroic one”) is an annual event in Tuscany that celebrates the great, bygone era of cycling before doping, science and sideburns were so prevalent. 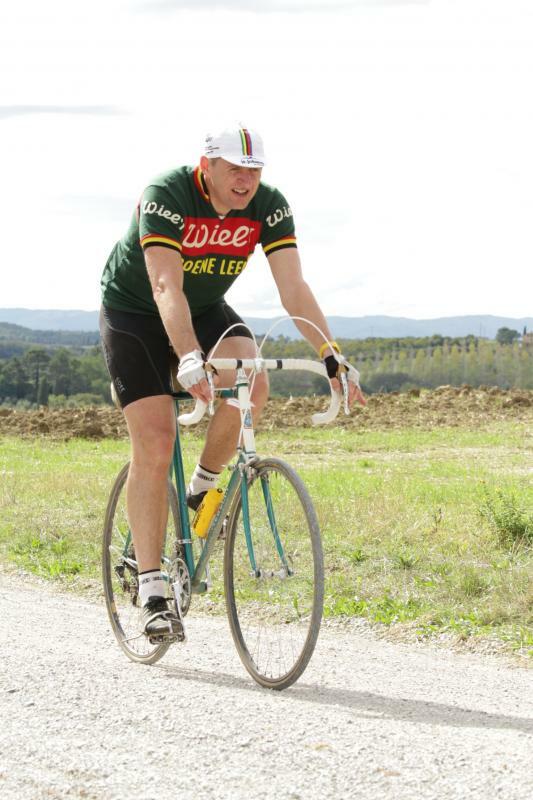 Based in Gaiole in Chianti, l’Eroica started in 1997 as a way to celebrate cycling history but also to halt the paving over of the strade bianche, the white dirt roads that cross cross the region. 15 years on, l’Eroica is wildly popular with entry list closing almost as fast as it opens – there is even a professional event in the Spring and the Giro has used the strade bianche in recent years too (cue images of ghostly looking riders, covered from head to toe in ‘Tuscan toothpaste’). The concept is simple – ride one of a series of distances, on an old bike, in period clothing, stopping only to snack on cured meats, local cheeses and robust red wines from the region. Bike wise there are really only three rules – downtube shifters, exposed brake cables and pedals with toeclips and straps although many take it further with 1930s (and earlier) bikes and period clothing including Breton style heavy sweaters and goggles. I’d had a go in 2010 on a relatively modern Nuovo Record equipped Raleigh Panasonic and this years running allowed for an extended stay in the region to coincide with my 46th birthday – what was not to like? Staying up until midnight to ensure an entry, I was in. So were James and Melvin. Bring on la belle epoch! I blame Pervy Bob. Or his dad. Or possibly even his beautiful, unobtainable, older sister (she was two years older which meant that at the time she was pretty much Mrs. Robinson. Oh, and she spoke fluent French which only added to the unobtainable mystique). Actually, most of all I blame Pervy Bob, and not only for the effect the following had on me. Back in 1986 I was at college and Pervy Bob invited me for a weekend in Nelson; despite his name this was in no way sinister. Having enjoyed a pleasantly boozy Saturday night I was a bit put out to be raised from my slumber in the attic at some unearthly hour the next morning to go and watch Pervy Bob’s dad perform unspeakable acts in public. I must admit that I was a little unnerved to be standing on a desolate and godforsaken hillside with no idea what to come – and then men appeared racing down the grass on bikes. Very fragile looking bikes heading at top speed down a gradient that would have given me pause for thought about walking down. Occassionally one rider would decide to leave his bike behind while performming acrobatic feats rarely seen outside of Billy Smart’s Big Top – I swear to this day that one bearded fellow exited over the bars, performed a perfect forward roll to standing and proceeded to run down the hill (no mean acomplishment when the bike was fitted with toeclips and straps pulled tight and he was wearing studded Walsh fell running shoes), although the effect was slightly spoiled when he had to return up the slope to retrieve his bike. Memory may be betraying me (again) but the fact that it was a grassy slope indicates that I was spectating on the descent off Ingleborough near Cold Cotes but I was awestruck by what I was seeing – this was well before the days that mountainbikes were ubiquitous and I wasn’t one of those kids who went scrambling around the local woods on a hopped up Raleigh Arena – and there was no way that I would ever achieve the levels of fitness never mind skill to match these wiry men of iron. But I was intrigued and an itch started that wouldn’t even be mentioned, let alone scratched, until 21 years later in 2007. 6 years ago I was on the cusp of 40 and in time honoured fashion wanted to celebrate in a suitable manner (no, not that way, hookers appear chronologically much later in this tale). My Mate Dave had always talked about his Raid Pyrenean adventure, so, with his able logistical support, I decided to take on the major climbs in the Pyrennes, the Tormalet, Aspin, Aubisque etc. I was pretty fit from running and thought that would see me through. After 96 miles in 38C on the first days it was clear that this approach was fundamentally flawed. Over the next week climbs followed, descents were avoided (what’s the point in a hire car unless you’re prepared to use it?) and My Mate Dave’s smiling face, as he leaned out of the window to offer what he maintains to this day were ‘words of encouragement’, was seared into my mind. Moving on three years, the expensive counseling had stitched my fragile psyche back together and I was ready for the French Alps, Alpe d’Huez, Galibier, Croix de Fer and the rest. 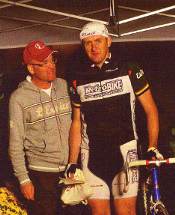 But this time My Mate Dave was riding – payback time! An enjoyable week was had cycling squares up Alpe d’Huez while looking down (metaphorically, literally and in every other way) on My Mate Dave several hairpins below. Somehow, despite sneering and gloating on my part (for which I am still proud), our friendship endured. Fast forward to early 2012 (fast forward into the past? Does that scan? 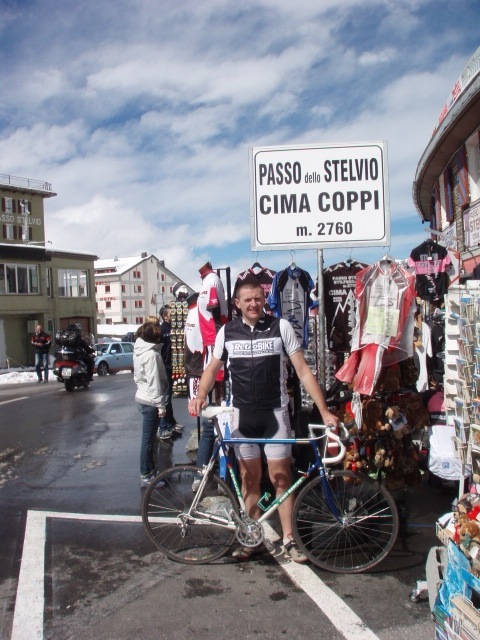 ), and My Mate Dave mooted a trip to the Italian Alps to take on some of the legendary Giro climbs – the likes of the Stelvio, Gavia and the reportedly fearsome Mortirolo. I wasn’t really going to say no, was I? Being both steeped in cycling folk lore and undeniably pretentions, I knew that the key to the whole trip was le metier. Having booked the trip 6 months previously I had plenty of time to organise equipment, body, mind. I thus timed it like a space mission as those never go wrong (apart from Apollo 13 and then Tom Hanks saved the day. Or was it Kevin Bacon?) and before I knew what had happened I emerged from a space/time vortex and was looking down the barrel of T -60 hours with a bike in pieces, skinned knuckles and a barked shin…..
Just 9 months after the first ever UK Handmade Bicycle Show in Bristol, the 2012 edition was upon us. There was a new venue, the pre-show publicity looked like it was going to be bigger, much bigger. John, armed with his ‘My First Canon’, and I went to find out. What follows is very much a personal perspective. The UK Handmade Bicycle Show 2012 www.bespokedbristol.co.uk was based at Brunel’s Old Station, basically part of the Templemeads complex. Waiting for The Guvnor to negotiate the one way system (he was within 10m a good quarter of an hour before he actually pulled up), I lounged outside on a wall in the sun, people watching. It was a battle between pretty girls with their floaty dresses and summer legs and bicycles. Steel bicycles. 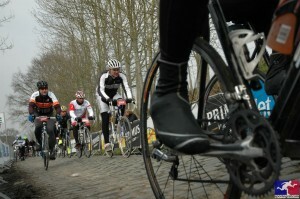 Although they were only Surly (frames not girls), the bikes won out. I’m not sure if that is necessarily a good thing to admit. Anyway, before I got the fury at a fixed conversion of a Corsa Extra, John arrived. As we made to enter the venue we were stopped by a pleasant security guard – “have you got tickets?”. I was affronted – didn’t he know who I was? Clearly not, as he would have realised that I don’t need anything as grubby as a ticket to gain entrance. Thankfully John said “our names are on the list” and we were whisked inside. First impressions? Bigger than 2011. Much, much bigger. Click to read the full Bespoked Bristol report. 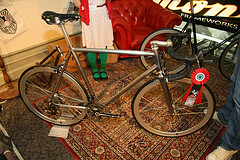 Full report and pictures of Bespoked Bristol 2011 can be found in the forum. - the first ‘half’ of the longer route was mainly road. Flat road. I am not complaining although I was at the time. Following discussion, we’ve very reluctantly taken the decision to POSTPONE the ride next Monday and give as much notice as possible so that people could alter their plans. This was not an easy decision to arrive at as the Turkey Twizzler is a very well established and attended event. 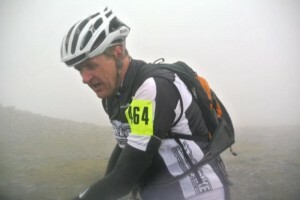 Although we recognise that weather forecasts are often unreliable, Cannock is supposed to have 4 inches of snow on Monday and never be above freezing between now and then so the riding could be a challenge but it was the getting there and back, with some people travelling vast distances, that was the key concern. We’re hoping to arrange a slightly surreal festive Turkey Twizzler in February, date to be confirmed. Ok, off to cancel the caterers. OWMTBC has always been a fairly loosely defined concept – we knew what we wanted to do but we didn’t necessarily want to hard sell it down people’s throats. ‘Build it and they will come’ was certainly my approach although I’m not sure who was Costner. It’s pretty self-indulgant to write up an event you organised but I’ve never lacked ego-centricity so here goes. Barely had the dust settled from OWMTBC09, indeed we were still on the ferry home, and Max had been co-opted onto the Organising Committee. A combination of fatigue and beer had him agreeing enthusiastically. And so it began, ending last Sunday in Betws-y-Coed with an impromptu Fireroad Half Wheel Challenge. But I’m getting ahead of myself. Way ahead. In darkest, coldest October I got the call from Neil – “I’ve got the venue for 2010!”. Slithering around the Marin Trail in the wet, 18 year old tyres protesting loudly, I wasn’t convinced but hey, the views of Snowdon were spectacular, we had a good base and the sponsors were already on board, so why not? On such naïve optimism do you achieve something great or be harangued in public by middle aged men who have paid you money. Only time would tell and I figured that glass half full or empty, as long as we had a glass we’d be ok.
Neil, Max and I got together again in Spring 2010 to re-ride the course and plan logistics. This went well until, in what can only have been a fit of pique, Neil through Max off a 15 foot drop. Max’s reaction was stoicism personified. Damn, it was definitely on now. Fast forward to late August 2010. Plans had not exactly worked out as expected due to personal circumstances on my part and Max disappearing down a mine in China for 5 weeks, a drastic move but one I was increasingly to respect, even covet. 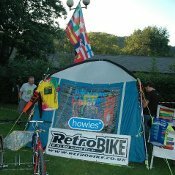 Howies, Retrobike and Orange on board and coverage from ‘Privateer’, the offroad (butch) sister to Rapha’s ‘Rouleur’, all we had to do was deliver. No problem for gentleman of our calibre I thought. But that was before I was confronted with the bear.